Hey, there. If you haven't seen me around yet, I'm Roller. I've been posting a bunch here since I became active and I figure it's about time I share some of my artwork because I think I need some sort of artistic outlet. A couple of my friends have such threads on here, namely Roserade, and I think it would be nice to have a similar thing for myself. I mostly work on music and writing, but I do some spritework and some Photoshop design too. I'm a primarily a filmmaker, but I don't think I'm going to post any of my videos on here as they feature myself or others in my life in-the-flesh and that could lead to a sticky situation. My writing is usually has a pretty affirmative tone to it, which is why I call this "Roller's Reasons", but I'm going to be posting a lot more than just writing, so don't let the title (or its flashy font) mislead you. If you have any suggestions, revisions, or constructive criticism to offer to any of my works, you are more than welcome to offer it. I always appreciate any advice. Expect to see a weird mix of seriousness and memes throughout the life of this thread. I'll start with something I wrote recently, not too long ago, and showed to a few people on the forums already. Believe me when I say that it is not worth it. Because the world prefers no change over change. Find yourself searching for more. To those who wait. You likely already read it. Everyone Is Here, Galactic Nova! Thank you for taking the time to check out this page. Here's a short story I wrote last November for my Composition class called L'agonie de la Soif, which literally means The Agony of Thirst in French. I got the idea for this when my teacher said "You could make the story about something as simple as a glass of water!" and that's exactly what I set out to do. jumping out to escape their wooden cage within the leg of the table. waitress realized this and apologized. "I'll come back with more, I'm sorry," she said dryly. Joe turned to me, obviously amused. "Tough luck." pouring more water at other tables. Sophie tapped me on the shoulder. was staring intently at the water. noticing this, rose his hand. "Excuse me," he boomed. "You're forgetting Micheal's order." to work out the miscommunication. water into my glass with gallantry. had spilled water all over Sophie's lap. She looked at me with fury in her eyes, and I knew I was going to get it. embarrassing misreadings to the whole room. table, never to be touched again. Excuse the weird formatting, I copied it from a PDF. I hope you enjoy(ed) it. I like to do some speech-writing too, so if you wanna check that out here's my speech for when I ran for Recorder for my high school this year. Hey, I’m [Roller], and I’m running to be your Recorder for the next school year. For two years, I’ve been in Convo, where ASB appropriates thousands of dollars towards a whole bunch of different school activities. Dances and socials, concerts and installations, field trips and arts classes, all of these are funded by ASB. But I hear a lot of people say “I don’t care about ASB”, “It doesn’t matter”, “I’ll just vote for my friend”. And maybe the reason everyone thinks that is that our school doesn’t do a good job of telling people what ASB does and why it matters, but when I hear this kinda stuff, it worries me, because ASB is an integral part of [school], and they represent you. Now, in case you didn’t read my Letter of Intent, I wrote that the reason you came to [school] is to practice your art in a “safe learning environment”, and ASB is critical to that. Because we wouldn’t be an art school worth its salt if it weren’t for everything ASB does for us. ASB is a representation of YOU, and what you want from the school, and brushing off ASB as a nonimportant part of the school is brushing off the whole reason you’re here in the first place. When you vote for all those positions in the library, you aren’t voting for your closest friend or favorite person, you’re voting for the person who think is best for the job. The person who cares most about the school. The person who will reflect your and your peers’ personal values the best. And that’s true for all the positions, not just High School Facilitator and Middle School Facilitator. Every position has more in their job than just writing stuff down, or counting money, or facilitating Officer’s meetings. We all have the job of representing you, as a school and as an individual. Maybe you think [opponent] will represent you the best, or [opponent 2] will. And that’s okay. But what I want you to know is that I care about ASB and Recorder and about our school, and I think you should too. Vote your conscience, as they say. And if I’ve appealed to your conscience, then I’d thank you to consider voting for me. What, you thought I would actually play that? This joke is completely unoriginal. "Opponent 2" ended up winning because she did an entire flip on-stage, but a lot of people told me my speech was the best, so I'll just take it and try again next year. Hopefully I'll win eventually! Rose asked me if he could use the "Wheelie" enemy from Kirby to depict me for the MBKG, but I told him to wait for me to rework a Wheelie sprite. Pretty satisfied with it, although any nitpicks on weird coloring or misplaced pixels would be much appreciated. I tried making the shoes pink as they normally are, but I decided to just keep them blue instead. 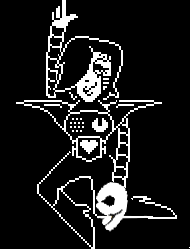 I was looking at some sprites online, and I saw Mettaton in an interesting pose and had an idea for a resprite, check it out by opening the spoiler. Alright, let's make this serious again. Here's a poem I wrote about a week ago that's got a bit of an edgy title--New Text Document. I guess a good second title would be Head-Spin and I can't choose between them so I'll just do both. Any other--Could it ever go well? It has never worked in the past, after all. All share--yet it's still unwelcome! It is scary to confront the feelings of another. Is it not but a farce? but who is that one? Can there truly be only one? and I am losing my mind, after all. if I have any love at all. I cling on to hope that there will be a day. The formatting is a little odd because I originally wrote it in Notepad, where you can't use things like Right Align (which this poem would've definitely benefitted from) but it still works nonetheless. Anyway, there it is.